I’m staring down the dessert menu at Applebees. 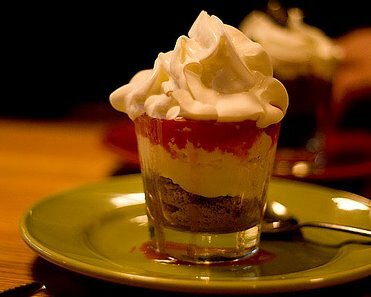 Surely after nine months of pregnancy and having a baby rip through my body, I've earned at least one of their Strawberry Cheesecake Shooters. Alas, the gut that's bulging out of my too tight "transition" jeans seems to disagree. The button thats barely holding me in is practically screaming for mercy. But, maybe I'll order it and have just a bite. However, I think Iremember trying this on several occasions and that's probably how I'vewound up with several pounds to lose in the first place. One bite and I'll end up licking the bowl. Ok, I scan my mind over the thousands of articles I've read about weight loss and dieting to look for some piece of advice that will pry the desertmenu out of my hand. Hmmm, somehow I don't think chewing a piece ofsugar-free Trident is going to cut it. I really should order it, I tell myself. I could get hit by a bus tomorrow and really wish I had eaten that dessert. However, I believe it to be more likely that I'm hit with guilt when I step on the scale. Aaaaah - the baby has started screeching and I'm starting to get dirty looks. I better get out of here. I high-tail it or waddle it back to my mini-van. Goodbye Strawberry Cheesecake Shooter - I've been saved by the baby. Unless, of course, I drive through Dairy Queen on my way home.